Dr. Lignell's research group studies turbulent reacting flows using computer simulation. Primary areas of interest include modeling turbulent nonpremixed combustion, soot formation and transport, flame extinction and reignition processes, and multi-phase flows. Simulation techniques include direct numerical simulation, one dimensional turbulence modeling (ODT), large-eddy simulation (LES), and a new technique under development, autonomous microstructure evolution (AME). Samples of previous and ongoing research results are highlighted below. Soot formation in flames is an important physical process as it accounts for the majority of flame radiation and is a pollutant. Soot is a particulate species with a low diffusivity resulting in strong differential transport between soot and gaseous species comprising the flame which affects soot temperature, formation and destruction, and emission. 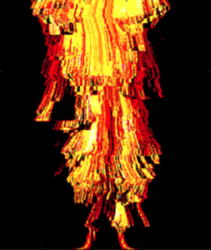 Modeling these processes in turbulent flames is aided by direct numerical simulation. 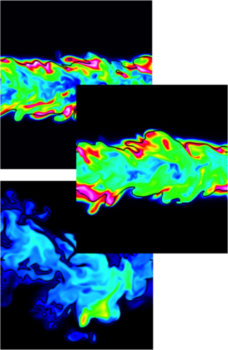 The image at right shows a two-dimensional nonpremixed ethylene flame decaying turbulence. Soot mass fraction is shown along with the stoichiometric isocontour colored by the relative velocity between the soot and the flame. Nonpremixed flames occur at the stoichiometric interface between fuel and oxidizer streams. The rate of combustion in these flames is limited by the rate of diffusive mixing of the streams. Turbulence acts to increase flame surface area and scalar gradients, hence increasing mixing. As mixing rates increase, finite rate chemical kinetic effects become important, and flame extinction may occur if rates of diffusive heat loss exceed the heat release rates of combustion. Local flame extinction results in flame holes through which unburned fuel may escape, reducing combustion efficiency and allowing fuel emission. High rates of flame extinction may result in unstable combustion, flame liftoff, and if excessive, global flame blowout, posing operational and safety hazards. Flame extinction and reignition are notoriously difficult processes to model due to the finite rate chemical kinetic effects, and complex reignition mechanisms that depend on the turbulent environment and flame structure. The degree of mixing in extinguished regions prior to reignition may affect the mode of reignition. At right are a series of three parametric simulations of planar nonpremixed jets with increasing levels of extinction. The simulations allow detailed investigation into reignition modes, and flame structures, providing high fidelity data for model validation, and fundamental insight into turbulent flame structure. Full resolution of three-dimensional turbulence fields is very costly from a computational viewpoint. The ODT model fully resolves a flow field along a notional line-of-sight. 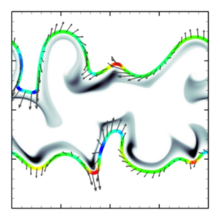 Turbulent advection is simulated through stochastic eddy events that are implemented through grid rearrangements via triplet maps. These eddy events occur with a given size, location, and frequency that depends on the evolution of the velocity field itself, in a way that mimimics that turbulent energy cascade. This figure at right shows a single realization of a 1 meter buoyant ethylene fire The flow is vertical with eddy events occurring at the locations shown at far right. A new, adaptive mesh ODT code is under development that is being used to build an AME code in which coupled sets of ODT lines evolve to provide detailed, affordable three-dimensional flows. Fires are notoriously difficult to model due to the wide array of complex and interacting physical phenomena including radiative heat transfer, soot formation, turbulent multiphase flow, often unknown or poorly characterized fuel properties, and a wide range of time and length scales. We are using ODT and LES to study flames and fires at increasing scales. The video at left shows an LES of an ethylene wall fire 1.83 m tall, and 0.61 m wide. The simulation was performed on 128 cores. ODT of the same configuration has also been performed. We have also performed ODT and LEM simulations of flame propagation through biomass fuel beds with application to wildland fires.